We all do not expect you to implement the LLRC recommendations, not even from HRC. Liberal Party of Sri Lanka condemns the abduction of Kumar and Dimuthu. Who says that he was abducted?Who knows whether this whole fiasco is staged managed to embarrass the GOSL.Before the alleged abduction has anyone seen this Mahathaya in person.When did this Mahathaya arrive in SL?Why in secrecy?The whole thing smells of a one huge rat. True, true Max, smells like a rat as for KP. Is it not? Now the time in Sri Lanka is rife, for a dog eating dog situation. The public will be entertained very soon to forget all other issues. 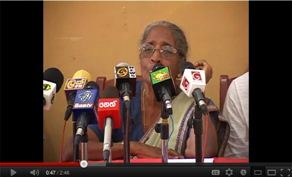 The mother’s statement was on Sirasa News last night. Judging by the way the families spoke, looked like they had reason to believe the two people are still alive. Reminds me of ‘May Chandrani, raa paaye avah’….. They must be with Prageeth Eknaligoda and the other dissapeared. However they are getting a dose of their own medicine which they lavishly dispensed for others then.